As entrepreneurs we strive as hard as we can to save every operating penny possible. In doing so, we often take on a lot more responsibilities than we should. Rather than hiring a team of staff that you can’t afford to pay during your first few years of business, you brush up on a few “how to” guides and you get to work on doing what needs to be done. While this is certainly commendable and sometimes warranted in the beginning stages of your business, over time it can lead to serious burnout, not to mention the diminishing success of your business. Of course part of being an entrepreneur or small business owner is having the ability to juggle several responsibilities. However, there comes a point in time where your hands are too full to juggle any longer. If you are in charge of human resources, finance, marketing, accounting, and customer service, chances are you have too much on your plate and need to reach out to someone for assistance. Being a blogger myself, I know that it is imperative to keep up with routine posts to ensure that you keep your readers interested and engaged. This essentially means finding the time in the day to come up with ideas, research those ideas, put it into your own words, and finally posting it. Not to mention keeping up with reader comments and responding timely. So if all of your energies are tied into developing new and interesting posts, how in the world do you find the time to market your business, find clients to write for, keep your finances in order, oh yeah, and take care of your daily responsibilities at home? Something is bound to fall by the wayside eventually, which is why you may need to hire someone to help you out on an as needed basis. While it would be nice for us to know it all, we simply don’t. With that regard in mind there are various facets to owning a successful business. When you’re not well versed in a particular area of business, for instance, managing your finances, you run the risk of doing more harm than good to your organization. Balancing budgets, maintaining financial reports, and even filing business taxes can become overwhelming if you’re not experienced enough. For this reason, many entrepreneurs and small business owners find an accountant that can assist them in maintaining their finances. While I used finances as an example (because it was a big one for me), this can apply to any area of business you’re not experienced in including marketing, IT, human resources, and more. Most of us don’t start a business because it’s simply “something to pay the bills”, after all, that’s what jobs are for. When you choose a career or passion such as a business it is your vision and it makes you feel good to do what you’re doing. Of course there are going to be times when you’ll wish you weren’t the boss and periods where you may feel a bit down, but all in all, when you’re passionate about what you’re doing, you can complete obstacles with a smile on your face. However, when you’re so bogged down that you can’t enjoy the various milestones and success of your business, you run the risk of burning out and simply losing the drive to succeed. This is never a good thing which may be a sign that you need help. When I first got started as a freelance writer, I thought this would be an easy one man show. 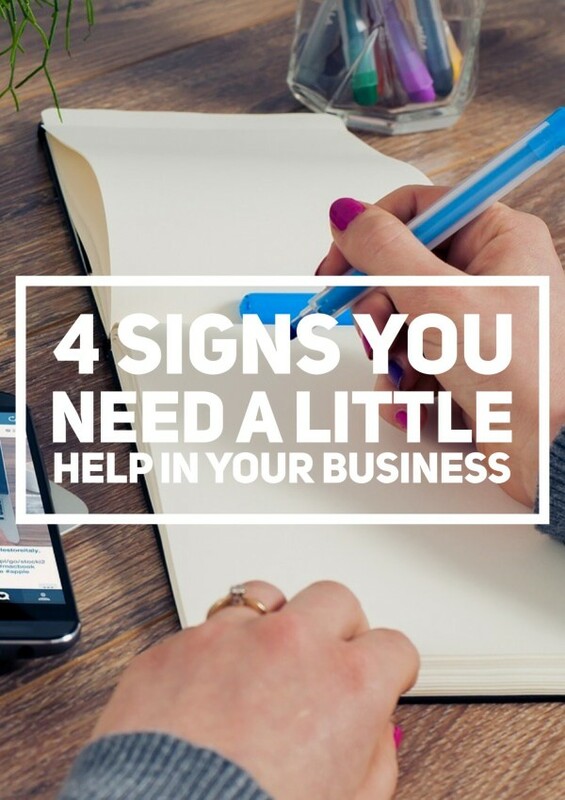 However, as time went on, I realized how much I needed help to keep my business afloat. While I didn’t need full time staff, I did invest in the services of other contractors and freelancers on occasions where things were really difficult. Whether it was a few writers to complete guest posts or an accountant to review my bookkeeping to ensure I’m up to speed, getting assistance most certainly freed up my time and helped push my business to the next level. If any of the above signs seem like something you’re going through right now, I recommend that you get help before things spiral out of control. Your business can only go as far as your limitations, experience, and knowledge, and as such sometimes it works to your advantage to rely on the assistance of other professionals to get you from where you are to where you want to be.